The Hokies got off to a hot start and jumped out to a 22-13 lead by making six of their first seven three-point attempts. UNC turned up the pressure and began to play better defensively, but the key point came when star guards Justin Robinson and Nickeil Alexadner-Walker – Tech’s two best ball handlers, passers and all-around players – went to the bench with foul trouble. With 10:48 remaining in the first half and the Hokies leading 22-16, Alexander-Walker picked up his second foul, and Buzz Williams took him out of the game. Less than 20 seconds later, Justin Robinson picked up his second foul, and Williams elected to keep him in the game, knowing that his team couldn’t compete with UNC with those two players on the bench. However, the strategy backfired, and Robinson was quickly whistled for his third foul, an offensive foul, with 9:52 remaining. It was a tough call, and a UNC player actually reached in and grabbed Robinson’s arm before the charge, but it was three fouls nonetheless. Robinson spent the final 10 minutes of the half on the bench next to Alexander-Walker. Alexander-Walker later returned to the game at the 2:03 mark of the first half, but quickly committed his third foul and returned to the bench. With those two players not on the court, the rest of the half deteriorated into a turnover fest for the Hokies. Tech committed seven of their 16 turnovers over the final 10 minutes of the half, and at one point the Tar Heels went on a 20-0 run to take a commanding 45-31 lead into the halftime intermission. Robinson and Alexander-Walker returned in the second half and played all 20 minutes, but partly as a result of their foul trouble and partly because of good play by UNC, they struggled to be effective on the defensive end. When Robinson left the game with 9:52 remaining in the first half, Virginia Tech was leading 22-18. UNC closed the half on a 27-9 run. With the game no longer in doubt for much of the second half, things turned into an offensive shootout, with neither team putting forth maximum effort on the defensive end. UNC outscored Tech 58-51 over the final 20 minutes. UNC was 36-of-67 (53.7%) from the field and 16-of-34 (47.1%) from three-point range for the game, but in the second half they were 20-of-33 (60.61%) from the field and 9-of-13 (69.23%) from the outside. Perhaps the biggest turnaround of the night for UNC was senior forward Luke Maye. He came into the game in a bad shooting slump, and was just 31.3% from the outside this year. However, he was 4-of-5 from three-point range against the Hokies. Foul trouble for Robinson and Alexander-Walker marred a great performance by Kerry Blackshear, who had 19 points, a career-high 17 rebounds, and five assists. He made all seven of his free throw attempts, and came away with a whopping 10 offensive rebounds against a talented UNC frontcourt. Ahmed Hill led Tech in scoring with 20 points. He was 7-of-16 from the field and 4-of-7 from three-point range. Nickeil Alexander-Walker had 19 points, three assists and three steals despite the foul trouble. He was 7-of-14 from the field and 5-of-10 from three-point range. Justin Robinson had 17 points and six assists, but played just 29 minutes. 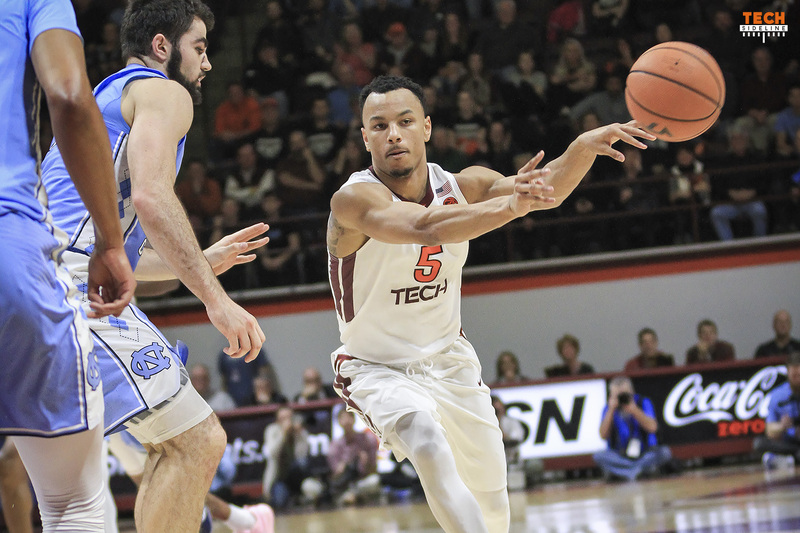 The Hokies played Monday night’s game without sophomore forward PJ Horne, who was out with a knee injury. As a result, Kerry Blackshear played 37 minutes and may have played 40 were it not for him picking up his fourth foul in the second half. Virginia Tech returns to action this Saturday when they host Syracuse in Cassell Coliseum. Tipoff is scheduled for 8pm, and the game will be televised by ESPN. Certainly the ever-so-thin bench was exposed as a glaring weakness. It seems like we can maybe work around having one key starter in some foul trouble, but with two we’re in for a bad game. That aside, I was struck by the class shown by one of our players when UNC’s Brandon Robinson went down hard near the end of the game, and the first person who went to where he was lying face-down on the baseline floor to check to see if he was hurt and then call for help wasn’t one of his teammates or a referee, but our own Justin Robinson. As frustrating as this game was to watch in many ways, and as frustrating as it had to have been for the players, certainly including Justin R., it was good to see him representing Tech the right way. There was another instance, too, where there was a collision and an NC player went down, and one or two Tech players (one of whom was likely called for a foul on it) reached down and gave the NC player a hand up. Never like to watch the Hokies lose, but when they do, I’m glad when they can still leave us feeling proud. I like Buzz and respect him but if your intensions are to win the game, you can’t leave your best players on the bench regardless of foul trouble and watch the momentum (which is how you lost) and the lead go away! 5 is a senior, tell him to not foul anybody!! We needed him on offense especially. Telling Robinson not to foul anyone is much easier said than done my friend….. This does not mean that Robinson cannot play under control but you are assuming that the officiating is going to be perfect even if Robinson did play under control and let us ask the “Saints” about relying on officiating to call the obvious stuff. Foul number 3 on Robinson was questionable if not just a straight up bad call. So Buzz, with all of the time remaining in the game had no other options but to sit him. The problem is that you must rely on other D1 level college basketball players to step up and at least protect the ball. Any scholarship guard at the D1 college level should be able dribble, pass and to protect the ball even if they are not an offensive scoring threat. To turn the basketball over 7 times in 10 minutes is ridiculous. So the depth not doing fundamentals was the biggest letdown IMHO…. My thought was that in putting Robinson and Alexander-Walker back in, you know there’s a risk that they’ll pick up another foul – what was a bit disappointing was how quickly they each picked up that next foul. Not sure how much of that was from UNC recognizing the vulnerability and going at them in hopes of drawing another foul versus them feeling desperate and maybe trying to do too much versus just bad luck and iffy calls. Could have been a bit of each, I suppose. Robinson is the key and I think he is pressing a little and it has affected his confidence. He is trying to make passes that just are not there. Two or three a game. Also, he is more out of control on his drives that in the past he made these shots, or did not turn it over. Hopefully he can correct his play. If he can, then this team has the potential to be a sweet 16 team. A lot of basketball to play, but we have played 2 good teams that hit 3-pointers at an unmatchable percentage, including players who are not normally good outside shooters. Our defense seems a step behind, and collapsing on the inside pass that leaves the open 3. Hopefully we will get better before we get too frustrated. Need to eliminate the silly reach-in fouls. Also, we never seem to use the ball fake to draw fouls on outside shots. See you Saturday. Our short team, our very short bench and big gap in talent compared to UNC was the real story. Blackshear played outstanding against UNC’s many bigs. However; we are only one L below expectations, Penn State. 11 wins in the ACC would be a real stretch for our guys, for sure we miss having Clarke and Nolley. Sad, Sad. Who is going to play point guard (effectively) next season? I’m concerned about our lack of ball handlers. We don’t have any depth; it showed with Robinson & Walker on the bench. Great work getting this article so quickly Blackshear did have a great game and his points came battling some defensive height down low. I was glad to see us finally shoot well on the road although, as you said, a lot of the offensive stats (other than the first few minutes) came in the 2nd half when the defenses were relaxed. I am not crazy about our defensive easing because a couple of times we made a mini run only to give it back. They kind of beat us at our own game, transition baskets, killing any chance we had to make the game more competitive. The first 3 road games have been rough for us even though GT gave us the win. It’s hard to beat good teams on the road but it has happened in the league this year. Maybe a more telling test for us will be when we play some of the lesser teams on the road. I had hoped we could win a few of those and get to 11 ACC wins but hard to see that yet. It will be a challenge for us to win all of our home games. Lots of bball left. Hope we can put it all together. I think we will beat the lesser teams on the road if we play with some degree of urgency and not overlook these lesser teams. The challenge is to be mentally up for the task to beat UVA, UNC, Duke, FSU and even Louisville or Syracuse on their home courts. With the exception of UVA and even ND last year, we have struggled mightily against the competitive teams on their floors and quite often, the games are not even competitive.Yet, we quite often play these teams well in the Cassell, win and heck even blow them out in some cases, go figure. So it is all a mental game / mindset that I am sure Buzz is trying to instill but must be displayed for us to have road success. Still much BBall and we must dig in mentally and play with toughness the rest of the way.